Globetrotting toon Zorro the Chronicles from Paris-based Cyber Group Studios will bow in the US on Hulu. 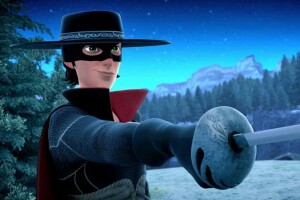 Paris-based Cyber Group Studios has secured a digital-first US premiere date for its CGI-animated series Zorro the Chronicles after striking a deal with SVOD service Hulu. The 26 x 22-minute action-comedy for six to 12s will be available to stream on Hulu starting July 23, in both English and Spanish. Written by Cyber Group CEO Pierre Sissmann and Annabelle Perrichon, and directed by Olivier Lelardoux, Zorro the Chronicles follows the adventures of a teenage Don Diego. The series, which Cyber Group produces in partnership with John Gertz’s Zorro Production International and Blue Spirit Studios for France Télévisions and Italy’s RAI, has already been snapped up by multiple broadcasters around the world including Turner and Citel (France), RTVE Clan (Spain), YLE (Finland), SVT(Sweden), DR (Denmark), TéléQuébec (Canada), Minimax (Eastern Europe), Globosat (Brazil), Spectrum (Indonesia), Thai PBS (Thailand) and Al Jazeera (Middle East). It was most recently acquired by Chinese distributer WeKids for a number of television and VOD platforms throughout China, Hong Kong, Taiwan and Macau. The pickup by Hulu further strengthens the platform’s expanding kids library which recently grew thanks to an exclusive content licensing agreement with Disney for more than 500 TV episodes and 20 original movies.